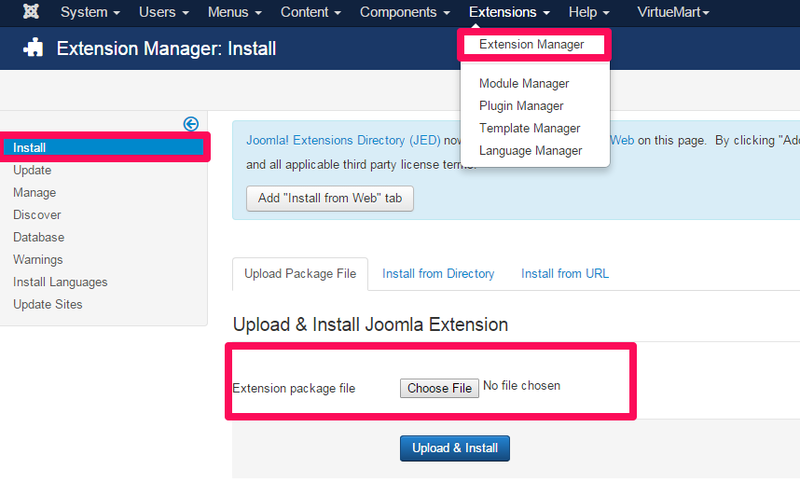 The installation of Jom Classifieds is the same as other Joomla extensions and can be done through the Joomla extension manager. When you purchase Jom Classifieds extension from our site, you will receive an email containing the extension in a zip file called Jomclassifieds_3.7.0.zip. Follow the instructions below and you will be able to install the extension easily. Once you have purchased our premium subscription from our site, you can download the Jom Classifieds installation package directly from your account page. When you finish the installation process, the component, modules and all the plugins come with the extension will be installed automatically to your site. The table below lists all the items were installed and the function of them. Jom Classifieds component Component The main application. mod_jomclassifieds_categoriesmenu Module Display all top-level categories or sub-categories from the selected category in a module position on your site. Users can then click on a category to see all adverts from that category. 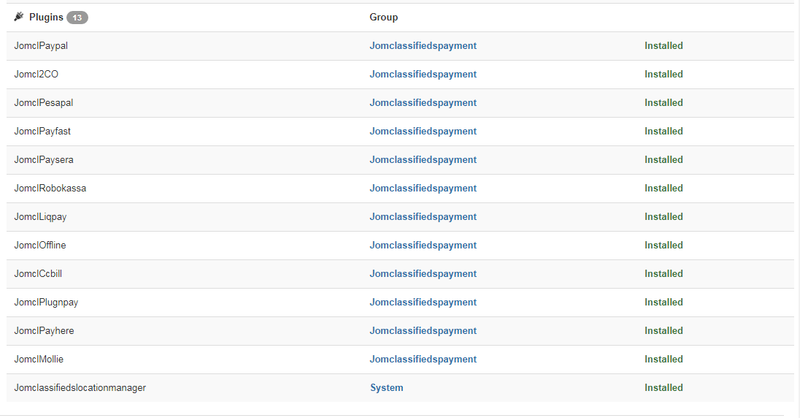 mod_jomclassifieds_locationsmenu Module Display list of locations in a module position on your site. Users can click on a location to see all adverts from that location. mod_jomclassifieds_adverts Module A module to display Free Ads, Top Ads or particular category adverts as a carousel in a module position on your site front-end. Several other options are available..
mod_jomclassifieds_search Module A module to search adverts through Advert Title, Category, Locations, Promotions, Memberships, Price, Extra fields, Tags. mod_jomclassifieds_maps Module A module to display adverts in map from particular category or from all categories and several Filter options are available to display the adverts. mod_jomclassifieds_compare Module A module that is used to compare two or more listings in separate segment and provides the details in a comparative manner. mod_jomclassifieds_changelocation Module A module that is used to access the user location automatically or manually. User will be able to choose any location and obtained the listing and its information on the location chosen. Paypal Plugin A plugin to process Paypal payments. Pesapal Plugin A plugin to process Pesapal payments. 2Checkout Plugin A plugin to process 2CO payments. PayFast Plugin A plugin to process PayFast payments. Paysera Plugin A plugin to process Paysera payments. Liqpay Plugin A plugin to process Liqpay payments. Robokassa Plugin A plugin to process Robokassa payments. Ccbill Plugin A plugin to process Ccbill payments. Plugnpay Plugin A plugin to process Plugnpay payments. Payhere Plugin A plugin to process Payhere payments. Mollie Plugin A plugin to process Mollie payments. Offline(Bank Transfer) Plugin A plugin to process offline payments. Location Manager Plugin A plugin to active the Geo location. - Login to your Joomla! admin. - Select "Extensions => Extensions manager => Install". - Browse for the downloaded Jom Classifieds package and click "Upload File & Install". Thats' it. Now, Joomla! will upload the package on your server and install the Jom Classifieds component. This process can take more than 1 minute. Finally, you should see a result of all installed extensions (Component, Modules and Plugins) as in the below screenshot.